The Indian microfinance sector is growing by leaps and bounds but concerns remain over high costs and the direction in which it is headed. 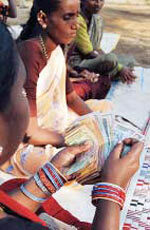 Microfinance continues to grow fast and furiously—but also narrowly and somewhat purposelessly. This is a rather sobering verdict of the State of the Sector Report 2008, which reviews the progress of the sector every year. The past trends of growth in wellendowed and high-growth areas and among better-off clients with no effort to consciously target the poor, high costs for lenders and borrowers and lack of depth of services remain matters of serious concern, says report. The sector saw impressive growth in terms of client coverage and the outstanding portfolio of loans. During the year, clientele expanded by 9.9 million— after eliminating the overlap between the clientele covered by self-help group-bank linkage programme (SBLP) and microfinance institutions (MFIs)—taking the number of total clients to 54 million. The outstanding loan portfolio also grew by nearly Rs 2,500 crore. “This is the first time that the narrowly defined microfinance clientele has crossed the 50 million mark,” notes the report, adding, “Never in the past has such sustained growth taken place comprising several different organisations in policy, operations and technical services acting in concert. The level of optimism in the last two years has rarely been witnessed.” But the report also draws attention to the problems facing the sector. It lists availability of funds, increasing resource costs, higher risks, limitations on HR availability and also a passive policy environment as constraints to the growth of the sector as a whole. Then, there have been issues of low access to commercial funds for not-for-profits and poor soft fund support to forprofits. Federations seem to face problems in raising resources forcing them to become state-dependent, except in the case of mutuallyaided cooperatives, says the report. The year also saw the continuation of the trend of heightened activity by private equity and venture capital funds. Aavishkaar-Goodwell and Grameen Capital India were the two new domestic investment funds launched last year, while international investment funds Legatum and Sequoia forayed into the microfinance sector. Also, existing players such as Lok Capital and Bellwether significantly increased their asset base. According to the report, a number of mainstream private equity and venture capital funds (India Equity Partners, Gaja Capital and Reliance Capital) are increasingly looking at microfinance as an investment focus area. However, the report notes with concern the continuing skew in favour of the southern region— which continues to have a much larger share of the outreach and volumes than the other three regions put together. Both the SBLP and MFIs have a strong presence in the southern states of Andhra Pradesh, Karnataka and Tamil Nadu, which together account for almost 52 per cent of clients and 59 per cent of the portfolio outstanding. Those in the industry, however, see this changing. “In the East, the number of customers has risen from 20,000 three years ago to about 2 million today. Now, we see this gradually happening in the other regions, too,” says Vijay Mahajan, a microfinance industry veteran and Chairman of BASIX. The report also notes that “consolidating the existing client base and fulfilling their financial services needs more comprehensively hold the key to lower costs, higher returns and client loyalty’’. The sector has its share of challenges, including the lack of depth of engagement and shortage of human resources. “Growth is confined to credit, with very little insurance and savings coverage. Even in credit, increase in client numbers… did not lead to deeper engagement with clients in terms of larger loans and diversified products,” the report says even as it calls for addressing the issue of depositor’s safety through a separate mechanism of deposit insurance.